When we limit God, we are also changing his character. 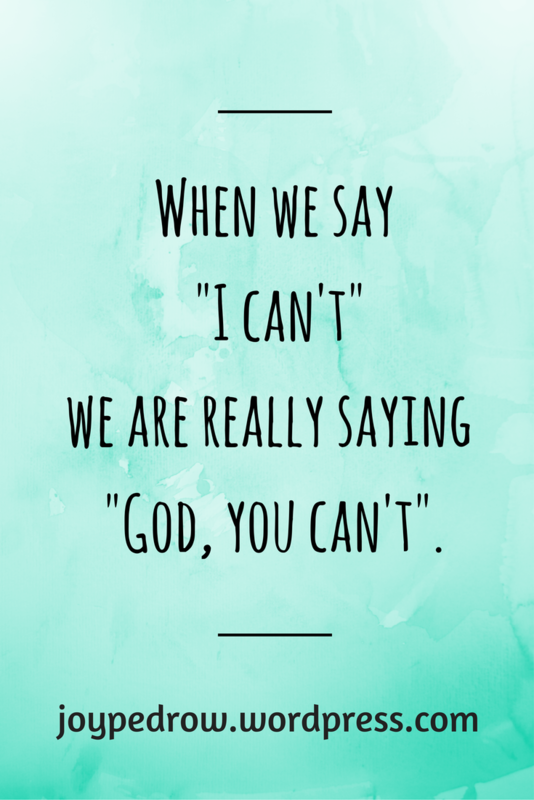 For example, saying “I can’t” actually puts us in disagreement with what scripture says about God. Scripture does not say anywhere that we are powerless when God is with us. In fact, every part of God’s word tells us we can! “I know how to be brought low, and I know how to abound. In any and every circumstance, I have learned the secret of facing plenty and hunger, abundance and need. I can do all things through him who strengthens me.” -Philippians 4:12-13. “Again I tell you, it is easier for a camel to go through the eye of a needle than for a rich person to enter the kingdom of God.” When the disciples heard this, they were greatly astonished, saying, “Who then can be saved?” But Jesus looked at them and said, “With man this is impossible, but with God all things are possible.” -Matthew 19:24-26. “So to keep me from becoming conceited because of the surpassing greatness of the revelations, a thorn was given me in the flesh, a messenger of Satan to harass me, to keep me from becoming conceited. Three times I pleaded with the Lord about this, that it should leave me. But he said to me, “My grace is sufficient for you, for my power is made perfect in weakness.” Therefore I will boast all the more gladly of my weaknesses, so that the power of Christ may rest upon me. For the sake of Christ, then, I am content with weaknesses, insults, hardships, persecutions, and calamities. For when I am weak, then I am strong.” -1 Corinthians 12: 7-10. If you are doubting the power of God, spend some time journaling and praying through these verses. You can also read two of my other posts about this topic: Stop Limiting God and “I’m not qualified”. I pray that you will begin to understand that the power that created the world is inside of you. You can experience more life change than you ever dreamed possible. « Cry out to God: When will this hurt end? You always have such encouraging blog posts and they’re always on something I need to hear! 🙂 Thanks for linking up to Motivational Monday! Awe thank you so much for your encouraging comment!! God gets all the credit!